Charlotte residents in neighborhoods that are facing increasing development pressure should speak up to their legislators about House Bill 201. It eliminates the ability for neighbors to file protest petitions against rezonings. The current state law on protest petitions gives immediate neighbors some leverage when a piece of land is up for rezoning. Five percent of neighbors next to a project can sign a petition that triggers a rule requiring 75% of the city council to approve a rezoning. In reality, these petitions often don’t stop development, but they give neighbors negotiating room for things like green buffers, fences or walls and input on design things like height and drive-through windows. Close-in neighborhoods in Charlotte are having a bit of a redevelopment moment, with denser apartments popping up, especially where walk scores are high. So the proposed repeal is important to NoDa, Villa Heights, Plaza Midwood, Dilworth, Elizabeth, South End and Myers Park. The repeal, however, affects the whole state and affects those in farther-out suburbs too. It’s easy to sign an online petition these days, but organizing a protest petition for a rezoning remains hard, with detailed rules about who qualifies as a neighbor and hard-copy signatures necessary. 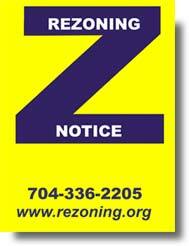 A recent rezoning request in NoDa illustrated the issue, with nearly 1,500 people signing an online petition to “Save the Chop Shop,” but with zero – zero – people showing up at a public hearing to speak against the rezoning. Developers and some legislators claim the current rules allow neighbors to hold property owners hostage, and that’s far from the truth. The current rules simply give immediate neighbors some leverage, protecting neighborhoods from overheated redevelopment that can destroy the very character that made the neighborhoods attractive. If you want to preserve your ability to influence development right next to your home, find your state representative and give them a call or email about House Bill 201. A legislative committee turned down efforts to stop requiring local governments to place legal ads in newspapers this week. Polls in North Carolina of county plus town and city governments show local governments spent about $6 million last year on legal ads and public notices, according to the Associated Press. Discussions about the notice requirements ran hot and heavy among Charlotte Twitter people. Discussions centered on the print and online circulation numbers for established media as well as the lack of online access for specific groups. The Charlotte Society of Professional Journalists will likely put the issue on the agenda of a future meeting. Here’s the full story on legal notices in newspapers in North Carolina. The City of High Point spent $49,000 on public notices in Fiscal Year 2009-2010. The High Point Enterprise had a Sunday print circulation of 18,300, according to the Audit Bureau of Circulation for the six-month period ending March 31, 2011. The City of Greensboro spent about $128,000 in public notices in two local newspapers since January 2010. The Carolina Peacemaker, which received about $31,000 from the City of Greensboro, appears to have a print circulation of about 5,000, weekly, though those numbers could be out of date. On its own site, it lists a readership of 60,000, likely including online numbers. Circulation numbers, in print and online, are difficult quantitative measures of reach these days. Some news organizations have free print products with large circulation numbers not included in the ABC numbers. Many news organizations measure their online reach in ways that are not comparable. Much of the Twitter discussion in Charlotte the past week centered on these numbers; I’d suggest moving the conversation up a level or two to look at all the possible futures of public notices before focusing on specific ways to compare influence and reach. Noted by TriadWatch: The Charlotte Observer partners with legalnotice.org to display legal notices in a somewhat searchable way, supported by advertising. The screenshot above is from a search through the organization. The “About” page gives little details about the company. The company also provides subscriber services. Worth consideration: More granular, searchable, open information could enable more detailed search information, provided in more accessible, easy-to-use interfaces, available to more readers and new companies, perhaps even local startups. Also from Alexa: 170 sites link in to legalnotice.org, and its traffic rank in the United States is 143,925. For this legislative session, the issue is off the table. But it will arise again. We should talk more and include experts in a variety of fields. We need to move beyond thinking the issue of the cost of public notices and legal ads is merely two-sided, with established media on one side and with cash-strapped taxpayers and governments on the other. I’ve always heard my city had historic gold mine shafts in unexpected places. But some poking around online opened my eyes to some intriguing hidden spots with amazing visuals in my city, and the people who explore them. This photo is from aurelie, created on Sept. 13, 2009, and shows a drain that resembles a mine shaft in urban Charlotte, about 2 miles away from downtown Charlotte’s shiny new office towers. There’s much more, from across North America, at Urban Exploration Resource. In my media bubble, I had no idea there existed such a network of underground and up-high creators on blogs and forums, seeking adventure. It’s a good reminder that not everyone is broadcasting on the big social networks and that niche communities are creating amazing content in their own hidden gardens. Those gardens aren’t even walled; they’re just niche. Smart information curators and journalists will keep in mind they exist, and turn around occasionally from the direction where everyone else is looking, to find unique, interesting content and perspective. See more for yourself, at No Promise of Safety.